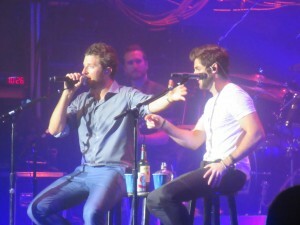 Thomas Rhett and Brett Eldredge brought the opening night of their co-headlining “Suits & Boots” Tour, sponsored by CMT, to New York City’s Terminal 5 this past Thursday and put forth two very different yet rousing sets. Both artists are coming off of new album releases which have both sold very well in the initial weeks. 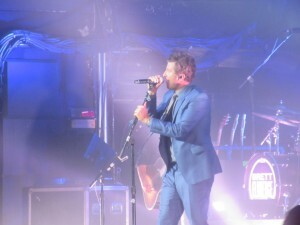 Eldredge released “Illinois” and Rhett followed that a few weeks later with “Tangled Up”. Both albums showcase different shades of today’s country music with Eldredge staying within the borders of today’s version of traditional country music, while Rhett stepped outside the genre and predominately made a pop album with a touch of twang. Their sets followed suit and the crowd responded emphatically all night long. 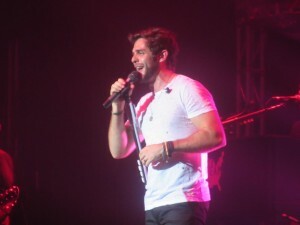 Thomas Rhett performed before Eldredge, but got a much bigger response from the crowd throughout his set. His setlist was full of hits from his first album as well as multiple cuts from his newest release. That being said, the crowd seemingly knew every word and danced and sang along with the country pop star. He opened with “Anthem” and was dressed with a suit jacket, white t shirt and jeans. He danced around the stage doing his best Bruno Mars/Justin Timberlake impression, but it was not forced or done so in a cheesy way. His country-pop persona comes across very authentic and his set was very professional, with no lulls whatsoever. The lyrics to “It Goes Like This”, “Make Me Wanna” and “Get Me Some of That” were so well known by the crowd that TR didn’t even have to sing at points. And songs such as “Die A Happy Man” and “Playing With Fire”, the latter of which featured tour opener Danielle Bradberry, created a good change of pace from the otherwise non-stop party. But, by the time TR finished his set with “Crash & Burn”, the crowd was fired up and having fun. 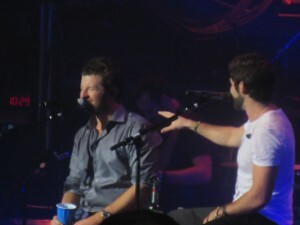 And in turn, you could tell Rhett was as well. It was a spirited set throughout that was equally impressive and, simply, a lot of fun. Eldredge came out for the start of his set in a suit and tie, obviously taking the name of the tour quite literally. His set did not garner the same crowd reaction as Thomas Rhett’s did, but I thought his performance was quite steady. The setlist had some ups and downs as it was clear the crowd did not know the newer songs as much, but when he sang his many hits, such as “Beat of the Music”, “Mean To Me”, and “Lose My Mind”, the crowd reverted back to sing-a-long mode. He seemed to really be excited about his new single, “Drunk On Your Love”, stating it was the catchiest song he’s ever written. But, his song “Don’t Ya” had arguably the biggest reaction of any song that night. Brett’s genuine charisma signed bright on that song as the tall and lanky singer stomped and flapped around the stage with a big old smile. His final song choice, “The Shadow”, was rather head scratching as I find it to be one of the worst songs on his new album and did not connect with the crowd whatsoever. I was a bit surprised that he did not sing the title song from “Illinois” nor “One Mississippi” as both ballads are some of his strongest songs to date. That being said, his set was also fun and showcased his likeability perfectly. For the encore, both Thomas Rhett and Brett Eldredge came back out and sat on stools to do an impromptu acoustic set in which they each choice random songs and sang snippets. I thought this portion of the show really fell flat as it seems very unrehearsed and quite sloppy. They did way more talking than singing which made the whole encore quite choppy. They sang songs such as Kanye West’s “Gold Digger”, Brooks & Dunn’s “Neon Moon”, and Frank Sinatra’s “How You Look Tonight”. However, I hope as the tour progresses, this portion of the show cleans up quite a bit. Otherwise, I really found the two stars’ sets to be enjoyable and well worth the money. On the major down side was the venue itself. The head seemed to be cranked to well over 100 degrees and way more tickets were sold than standing room was available. Everyone was sweating quite profusely and I saw many people walk out saying they just could not see the stage. Terminal 5 really did not deliver on that front.